Today's "I Want to Be" Series features Michelle Lehmann, a mom who's online site reCrib is a popular marketplace for people to buy and sell the best designed, gently used baby and kids gear. Find out how to connect with Michelle at the end of this article. We launched reCrib in April 2011. What led you to pursue this business? We were moving apartments and realized we had a lot of baby gear we needed to unload. We assumed a site for buying and selling gently used baby gear existed but were surprised to find out it didn't. So we created one. Are you full time or part time? My husband runs reCrib full-time and I work on the PR and marketing for the site. I also have another business, Michelle Lehmann Communications, a boutique pr and marketing company with a focus on food, travel, design. With reCrib, we launched with a ton of publicity and buzz. People - moms, dads, media - were immediately excited about the idea. And so there were a lot of stories about us including in the NY Times and Daily Candy, as well as several mom blogs. It was exciting to know that this idea connected with people! Additionally, we do a lot and have a strong community on Facebook and Twitter. We have partnerships with local baby and kid stores and organizations, and other like-minded companies. 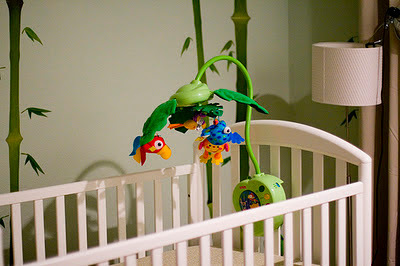 We are also have our blog at http://blog.recrib.com, where we interview interesting people in the baby/kid world. What is your favorite part of doing this line of work? Working with my husband on an idea that we are both passionate about and one that we feel is really needed in the parenting world. And seeing that it really resonates with people. Plus, it's also good to know you are doing something that is good for the planet! What one question do you get most from people about running your business? Well, for me personally, I'll often hear, "How can you do it all, with two kids and two businesses?" We all struggle with balance! What advice do you have for others who want to get into a similar opportunity? Be passionate about your work. Do something you care about. If you have an idea for something, follow through on it; believe it can work. What websites or books do you recommend for tips? I just read Tony Hsieh's Delivering Happiness - it's inspiring for anyone starting a business, or whose career is in a rut. I read Mashable every day for web/tech industry news. For the baby/kid world, I love DwellStudio's blog http://www.dwellstudio.com/blog. Founder Christiane Lemuieux has such incredible style and a great POV, whether it's about parenting, design, food or travel. Check out the reCrib site and blog, follow them on Twitter, or check out the Facebook page! *Photo by dennis via Flickr.